I guess my palate was in search of something out of the culinary box. I went with the flow and it led me down the beta carotene path; a road that’s earthy and wholesome. I love carrots. I love them in salad, soups, stews, roasted and of course blended and made in a drink. It was going to be a chicken dish. However, my palate craved one that would stand out and simultaneously caress my taste buds. My plan was to use my earthy carrots and create a spectacular dish with roasted chicken. One that would surprise my somewhat temporary ‘picky’ palate. As such, I decided to make a creamy carrot sauce. Already I had four pieces of dark meat (2 legs/2 thighs) marinated with salt and black pepper to taste, crushed garlic and grated onions. Chicken was brought to room temperature. Onions and garlic were removed and set aside to go in when roasting. In cast iron skillet a drizzle of canola oil was heated. Then chicken pieces were dried and seared on both sides so as to lock in flavors. One of the three carrots was sliced length-wise and placed on top chicken for roasting along with lemon wedges. A splash of water was also added as well as grated onion and crushed garlic that were set aside earlier from marinade. Chicken roasted for approximately 45 minutes at 375 degrees turning once. 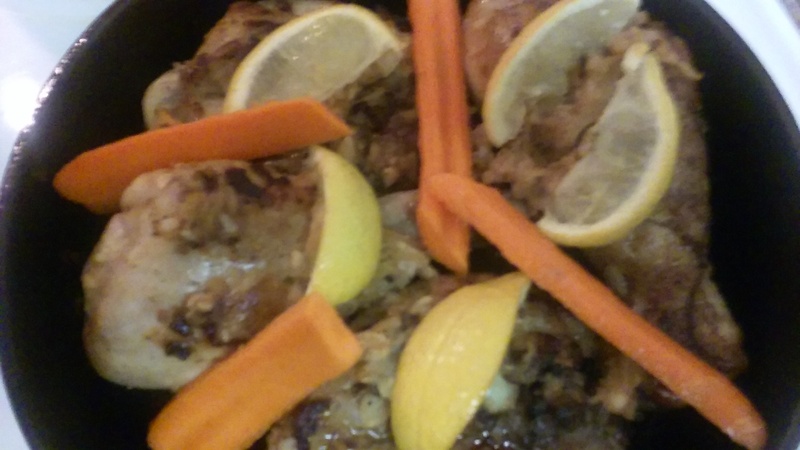 The juices expelled from chicken, onions, and lemon wedges were used to baste chicken. The other two carrots were roughly chopped and placed in a stock pot with tap cold water and a splash of milk for creaminess. To that, a pinch of cinnamon, salt, jalapeno (a small piece) and thyme were added. Carrots were simmered on low to medium heat until fork tender. After cooling, carrots were placed in blender and pureed to a smooth consistency. Then this was added back to stock pot along with a pat of butter for a silky finish. 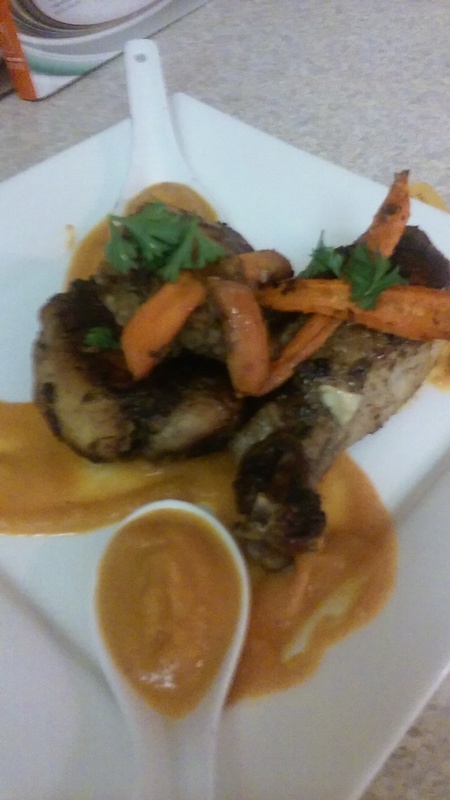 Roasted chicken was served alongside creamy carrot sauce with roasted carrots and fresh parsley as garnish.